If you’re a Harry Potter fan, you’ve undoubtedly wished you could ride the real Hogwarts Express, swig a cold bottle of butterbeer or, of course, find the perfect wand to cast spells. But did you ever think about how much those items might really cost? One devoted Harry Potter fan didn’t just think about it — they calculated a wizard-to-Muggle-money conversion rate. How Much is That Wizard in the Window? They used candy, a ride on the Knight Bus, hot chocolate, a water bottle and toothbrush, S.P.E.W Membership and three butterbeers to get the conversion rate. They determined the following: One galleon equals approximately $25; one sickle, $1.50; and one knut, five cents. This means a butterbeer from the Hog’s Head (yes, please…) would cost about $3. Aubieismyhomie didn’t stop there, though; the HP superfan also listed several takeaways. Harry only paid $175 for his wand — a bargain! The Weasleys were dirt poor: They only had $50-$75 in their bank account when they emptied it. 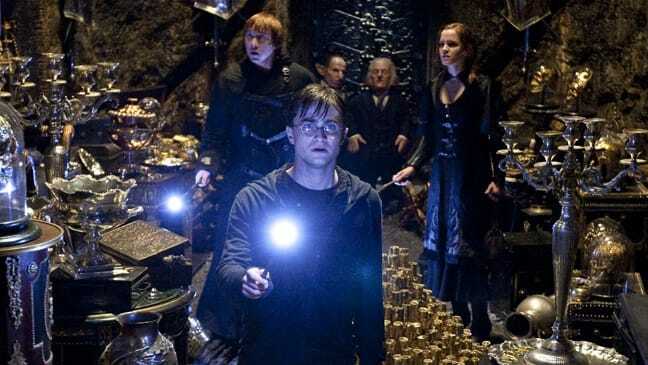 Harry was loaded, and generous: He spent $750 on Christmas presents for himself, Ron and Hermione, and gave Fred and George $25,000 of his Triwizard Tournament winnings to start their joke shop. Unicorn hair is worth $250 a strand. To put that in perspective, Bill Gates is worth about 3.168 billion galleons, Donald Trump’s worth about 160 million galleons… and Kanye West is still 2.12 million galleons in debt. Your Turn: Do you love HP? Do any of these prices surprise you?